Apart from performing, for a while I took on the very different role of show producer and here is my story. It was a Friday afternoon in February 2009 and we had our annual Comedians lunch in Melbourne attended by the usual around 25 funny people. At these lunches I normally speak for around 5 minutes and on this occasion I mentioned that I lamented the loss of our wonderful Melbourne cabaret/variety scene of the 70’s & early 80’s. The other comedians hotly agreed and just after that lunch I joined forces with cabaret/comedy legend Mitchell Faircloth aka Slim Whittle to produce a show to bring cabaret and variety back to Melbourne. The Crimson Goat Cabaret Club was born. Initially held at The Comedy Club monthly from August 2009 to December 2009, the shows were moved to glorious Ormond Hall from the start of 2010. As co-producers of The Crimson Goat, Mitchell and I would normally come on stage at the start and welcome the crowd before introducing the MC for the evening. Our MC’s were traditional stand up comedians like Glenn Robbins, Vince Sorrenti, Brian Nankervis, Lehmo, Tom Gleeson, Charlie Pickering, Akmal Saleh, Christine Basil and lots more big names. The acts were strictly cabaret/variety with humour and we had magicians, burlesque acts, ventriloquists, parody singers, impressionists, circus acts, character comedians and vaudeville acts. Performers like Flacco, Rosa the Russian Beautician, The Great Gondos, Darren Carr, Lawrence Mooney as a Dutch character, Geraldine Quinn, Elliot Goblet and Captain Matchbox were some of the performers. And the audience loved the huge variety on offer. We didn’t advertise but great word of mouth guaranteed huge crowds at every show. 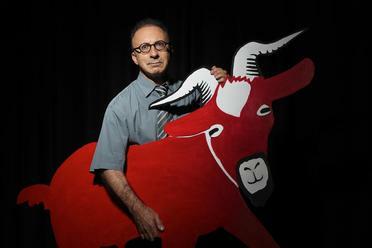 Another feature of our nights was that we presented a Crimson Goat Award to people who like a crimson goat, stood apart from the herd. Presented by my witty mother then in her late 80’s, recipients of this award included Father Bob, Les Twentyman, Sam Newman, Derryn Hinch and Moira Kelly. This presentation was always a popular part of the night and the banter between my mother and some of the recipients was pure gold.